Super Hero Boy: The perfect car for toddlers. The perfect car for toddlers. Connor has two obsessions.. ok three obsessions in life as of the moment. Dancing, cleaning, and cars. Except he likes his cars one of two ways.. either his huge dump truck that is almost as large as he is or a vehicle small enough that it will fit in his hands comfortably and go and small enough he can throw it in his bag and take it with us when we go places. With that said most cars in that size range are those cheap plastic ones you find everywhere, even dollar stores, and not only do those cheap plastic cars not hold up to a toddler's abuse for too long but who wants to see them scattered all over the living room. When Petit Baby told me about the small Vilac toy cars that they sell in their online store I was thrilled. 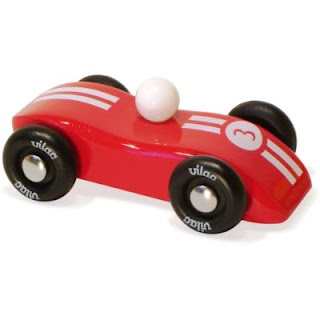 I've heard a lot about Vilac wooden toys but thus far have not been able to get my hands on them and the thought of having beautiful little wooden cars all over the living room floor seems so much more appealing than the alternative. I just had no idea how beautiful they really are. Vilac's cars look adorable in the pictures but if you see them in person from the goregous little boxes they arrive in to just how well they are put together and how great the tires are, they are just so much more impressive in person. 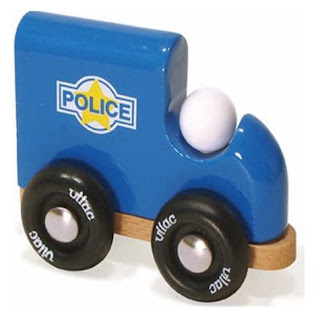 Connor got a Vilac Mini Police Truck , and though it doesn't quite look like any police car I have seen here in the states its square shape allows for Connor to grip it perfectly and he will spend hours just pushing it around the kitchen floor. I just need to teach him the right noise that a police car makes as right now the police car and his noise for a spray bottle sounds pretty much the same. heh. I honestly don't even think Connor has heard a real police siren yet and I seriously need to get his dad to bring the patrol car over here at some point so we can remedity that situation as I know he will love it. We also got a Vilac Mini Le Mans Race Car - Red and by far this has to be the prettiest wooden vehicile we have ever seen. Even the box is goregous in its bright yellow packaging. The design is simple, and its bright red, but there is just something really classic and beautiful about it though both of his Vilac cars take a beating thus far don't show any signs of wear even though Connor launches them off the couch on a daily basis I cringe every single time as they are one toy that I don't mind seeing laying about. While your over at Petit Baby check out their entire selection of wooden toys, I feel a little like a kid in a candy store browsing through their selections of wooden blocks, peg puzzles, wooden vehiciles, I could spend all day and make a list a mile long of items we'd love to own. If your looking for a last minute stocking stuffer or a small gift that will really make an impact pick up one of the Vilac cars while your over there. They certainly leave a lasting impression and they are a ton of fun to play with as well. Now that I think about it I may have to get Connor the Vilac Mini VW Beetle as I love the retro styling and cool color!